Excessive immune reactions can lead to the destruction of healthy tissues and cause auto-immune diseases. Specialized cells known as Regulatory T lymphocytes, or Tregs, prevent auto-immunity by suppressing inappropriate immune responses. But in cancer or chronic infections, Tregs can play detrimental roles by inhibiting desirable immune responses. How Tregs suppress other immune cells is not completely understood. Our group studies the suppressive mechanisms of human Tregs, with the long-term objective to design new therapies that modify Treg activity in patients suffering from cancer or auto-immune diseases. Tregs are very special lymphocytes. They inhibit immune responses to prevent the occurrence of auto-immune diseases. In cancer patients, they may favor tumor progression by suppressing immune responses against tumor cells: Tregs inhibit anti-tumor T cells. Our group studies how human Tregs inhibit anti-tumor responses. We focus on a protein called GARP, which is present on the surface of Tregs and controls the production of TGF-ß, a cytokine with potent immune suppressive functions. What are Regulatory T lymphocytes, or Tregs? The immune system protects organisms against microbial pathogens. In mammals, including humans, it is composed of white blood cells that patrol the body, scanning cells and tissues for anomalies characteristic of an infection. Encounters between immune cells and infected cells result in the destruction of infected cells and clearance of the microbe. However, the destruction machinery of immune cells endows them with the potential to also kill normal, non-infected cells, and cause pathological damages in otherwise healthy tissues. Several gatekeeper mechanisms exist to prevent immune destruction of healthy, non-infected tissues. Notably, a subset of cells of the immune system itself plays a very important role. These cells are known as Regulatory T Lymphocytes, or Tregs. They are specialized in the regulation of immune responses and prevent auto-immune diseases. What diseases are caused or favored by Treg dysfunction? In the absence of Tregs, a situation found in patients suffering from a genetic disease called IPEX, the immune system is left unleashed, becomes over-reactive and attacks many organs and tissues. This results in a so-called “auto-immune syndrome”, i.e. a disease with symptoms due to the auto-immune aggression of multiple organs. Whereas insufficient Treg function contributes to auto-immune diseases and complications of organ transplant, excessive Treg function can also be detrimental, and favor diseases that could otherwise be controlled by efficient immune responses. We are particularly interested in cancer. Indeed, our immune system is able to recognize tumor cells as abnormal, and destroy them as if they were infected cells. When a cancer becomes detectable in a patient, it is in part because his immune system was not able to control the growth of tumor cells. Tregs appear to inhibit anti-tumor immune responses, and thus favor cancer progression. Another pathological situation in which excessive Treg function inhibits beneficial immune responses is chronic infections, such as those causing AIDS or hepatitis.Fortunately, the genetic defect leading to the absence of Tregs and IPEX is very rare in humans. More frequent, in contrast, are auto-immune diseases that affect one or a few organs. These diseases include Crohn’s disease, ulcerative colitis, type I diabetes, multiple sclerosis, and many others. Although Tregs are present in patients suffering from these diseases, their immune-suppressive functions are impaired, and this may contribute to the pathology. Insufficient Treg function also favors rejections after organ transplant, pathologies also associated with excessive, unwanted immune responses. A particular case is that of Graft versus Host Disease (GvHD), occurring in patients grafted with a donor’s bone marrow to treat leukemia or another blood disease. GvHD is due to the attack of the receiver’s organs by immune cells of the donor, and could be prevented or attenuated by a more potent activity of Tregs. How do Tregs suppress immune responses? Because Treg dysfunctions contribute to many diseases, it is important to understand how these cells act. A precise knowledge of their immune-suppressive mechanisms could help design new therapeutic approaches to increase or decrease Treg activity, depending on the disease to treat. Studies in mice have revealed the existence of multiple suppressive mechanisms by Tregs. Which are important to inhibit anti-tumor immunity, and which operate in human Tregs remain unresolved questions. 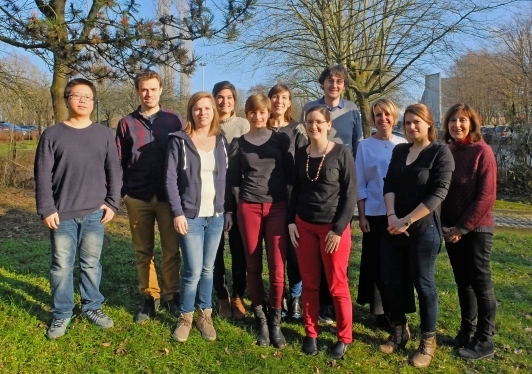 Our group studies immune suppressive mechanisms of human Tregs in the context of cancer. Human Tregs are very difficult to analyze because of the lack of reliable markers to distinguish them from other white blood cells. We circumvented this problem by deriving “clones” of human Treg cells. Clones are pure populations of cells that can be kept in culture for long periods of time, and provide very stable material to perform repeated experiments and derive robust results. We used our human Treg clones to identify functional features present in Tregs, but not in other types of lymphocytes, that could therefore mediate the Treg immune suppressive functions. We found that human Tregs produce a cytokine called TGF-ß. Cytokines are substances (proteins) secreted by cells of the immune system and exerting their effects on other cells. TGF-ß is very well known for its potent immune suppressive activities, and could therefore represent an important mediator of Treg function. 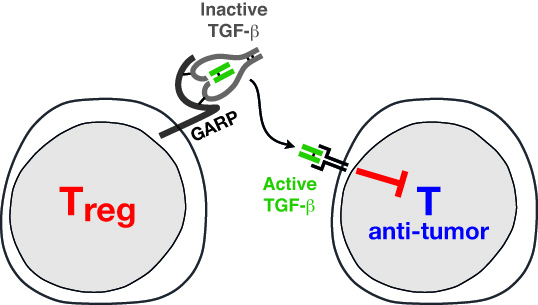 We also found that Tregs use GARP, a protein anchored at their surface, to regulate the production of TGF-ß. 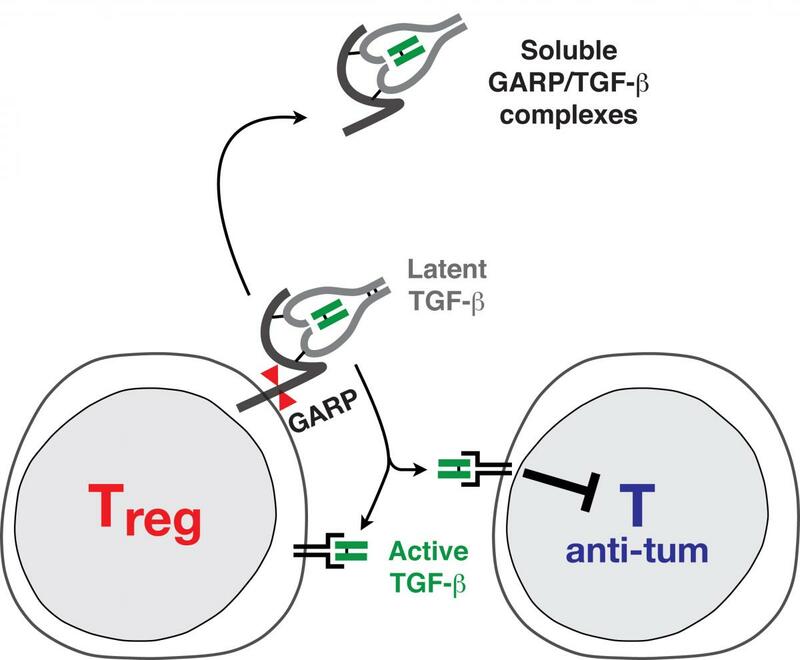 Our current work attempts to decipher the roles of GARP and TGF-ß in the immune suppressive activity of Tregs. 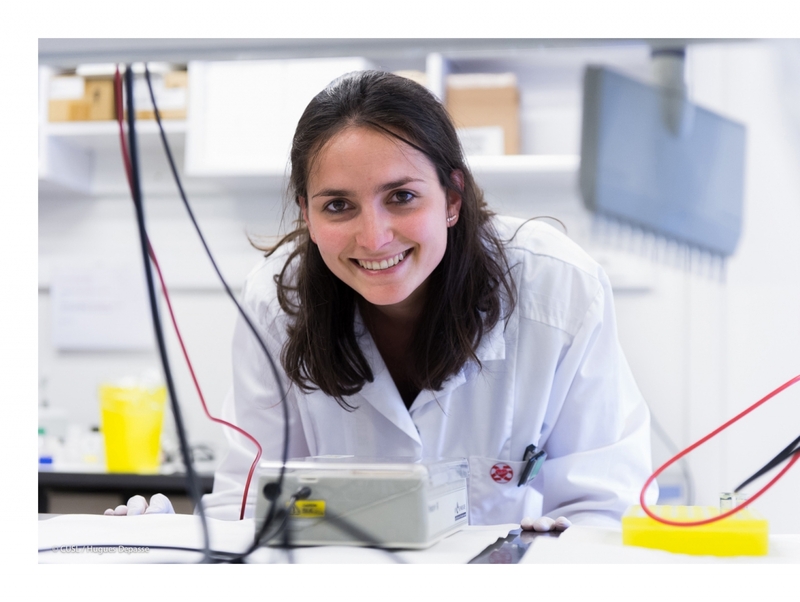 Our objectives are twofold: develop tools to quantify Tregs inhuman tissues, and identify mechanisms important for their suppressive function, which could be specifically targeted to improve the efficiency of cancer vaccines. We set up a methylation-specific real-time PCR assay to quantify demethylated FOXP3 sequences, indicative of the presence of Tregs. We used thisassay to measure Treg frequencies in the blood of patients who received tumor vaccines in combination with different potentially Treg depleting agents. None of the agents tested induced a significant decrease in Treg frequencies in a majority of patients. We attempted to use our assay to measure Treg frequencies directly inside tumor samples. But we observed that melanoma cells themselves could harbor demethylated FOXP3 sequences,probably as a consequence of aberrant methylation patterns that frequently occur in human tumors. This observation precludes the use of FOXP3 demethylation as a marker of Treg cells in tumors, unless tumor-infiltrating T cells are separated from tumor prior to analysis. More recently, we used our assay in collaboration with the group of Frédéric Baron (GIGA, University of Liège), to measure proportions of Tregs in clinical-grade preparations of human Tregs infused in NSG mice to prevent xenogeneic Graft versus Host Disease (GvHD).